Tracy Nguyen was born and raised in San Jose, California. Growing up with refugee parents from Vietnam largely defines who she is today: a driven community organizer with a creative, entrepreneurial spirit. She received a BA in Media Studies and Ethnic Studies from UC Berkeley, which seeded her activist journey. Since graduating, she has worked within the nonprofit sector to uplift the voices and power of refugees, immigrants, workers, women, youth, the LGBTQ community, and incarcerated individuals. With her passion for visual storytelling, she recently started her own work in film making and graphic facilitation. She believes that her art is strengthened by the depth of her community organizing and that her community organizing is strengthened by the reach of her artistic platform. Together, it is magic. 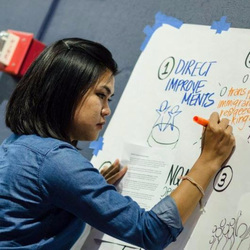 Recognizing the importance of oral and visual communication in many cultures, Tracy will use her Bay Area Inspire Award to provide graphic facilitation services to nonprofits that work with limited-English proficiency immigrants.